Qatar shares its borders with Saudi Arabia and the Persian Gulf, so this Middle Eastern country is an incredible mix of beautiful water views and sand dunes and desert excursions. Thought to be the newest Dubai for its oil-rich glitz and glamour, Qatar is also ranked as one of the 20 most peaceful countries in the world, and the most peaceful country in its region. Enjoy a holiday in one of the most underrated destinations for a modernistic Arab experience. Often referred to as the essence of Qatar, Doha is home to some of the most exquisite architecture, remarkable scenery as well as plenty of attractions to see and activities to do. The country's modern capital embraces futuristic architecture with beautiful towers and extravagant malls that make up an incredible skyline. While walking around this beautiful city, one cannot help but feel the prosperity and optimism that are the driving force behind this great city in the making. The highlight of Doha is undoubtedly the Doha Bay. It was constructed to form a crescent shape with footpaths and cycling tracks running alongside for an easy beautiful view of the waterfront. This famous Qatar landmark is home to the largest collection of Islamic art in the world, collected from three different continents. 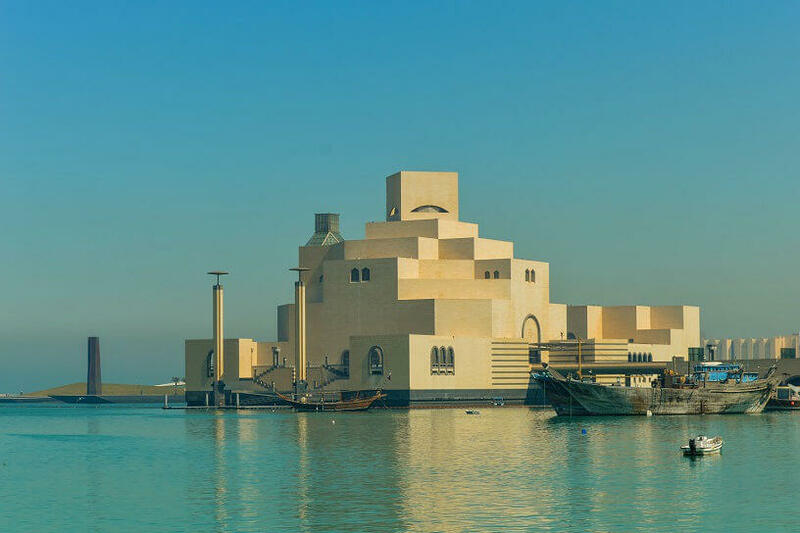 A walk through the Museum of Islamic Art will immerse you in traditional Arab history and heritage. Though the museum is located in Doha, you will have the pleasure of travelling to a private island for a visit. MoIA is built like a postmodern fortress with a moat and minimal windows, to cut down on energy use. Thought of as the social heart of Doha, you can easily pass away a day in this open-air market. Packed with shopping kiosks and restaurants, Souq Waqif has been in its current location for centuries, though the entire marketplace is newly renovated. Souq Waqif is often considered as one of the best locations in Doha to purchase souvenirs to remember your Qatari holiday by. Whether you are interested in traditional Qatari clothing, the beautiful embroidery, or exotic spices and perfumes, there are numerous traditional Arab items for visitors to purchase and bring home. The Al-Tawash restaurant is in an exquisite Qatari building and the only fine dining restaurant that offers traditional Qatari cuisine. Locate in the heart of the Souq Waqif, take a seat within the Beouin tent enclosure, on the open terrace or in the private enclosure and enjoy the culturally rich atmosphere. You will get a taste for a long-forgotten world while you sit on an upholstered cushion at a Syrian table in the soft glow from beautifully hand-painted lanterns. Khor Al-Adaid is thought of as an 'inland sea' because it is actually a huge salt-water inlet that extends into the desert and is surrounded by towering sand dunes. Cool off in the refreshing Persian Gulf water, even with desert views of typical Middle Eastern landscapes. The inland sea is one of Qatar's finest treasures and appreciates the shallow tidal lake, with a ride on a camel or the chance to sand ski either on a day trip or by camping overnight. At the Al Jassaiya site is where you will find petroglyphs. Petroglyphs are ancient stone carvings that are incredibly rare and an unbelievable sight. One of the most mysterious and attractive places you can venture off to, at this location in the Northeast of Doha you will find 900 carvings. These carvings at Al Jassaiya are thought to be some of the most astonishing in the world for their quality and state of preservation. All Qatar visitors should make the journey to see these archaeological treasures for both a history lesson and a glimpse into the ancient Arab world. Qatar has a dry, subtropical desert climate, with minimal rainfall and very hot and humid summers. In the summer, temperatures can reach up to a scorching 50°C. Spring and late autumn, specifically November through March, are thought to be the best times to visit Qatar because the temperatures are still warm, but not incredibly hot and the evenings can cool down to a very pleasant, mild temperature. Even still, Qatar has experienced abnormally warm winters, so it is best to be prepared and be aware of the weather before you leave.